The Wild Bills Electronic Squirrel Proof Bird Feeding Package offers all you need to begin feeding birds, while deterring even the most tenacious squirrels. Designed with animal training techniques in mind, the Wild Bills Electronic Squirrel Proof Bird Feeder provides squirrels and raccoons with a mild electric correction when they attempt to feed. The correction is only given when two metal contact points are touched simultaneously, so birds will not receive any corrections. Use the included Wild Bills Pole Adapter Kit to mount this feeder on the included Heath Telescoping Mounting Pole, and place the unit in your garden. This package comes complete with fifteen pounds of Wild Bird Seed Mix, Divine Blend, a Droll Yankees Seed Scoop, a Droll Yankees Bird Feeder Brush, 24", and a Stokes Beginner's Guide to Bird Feeding. The included Stokes Guide serves as the perfect reference book for the beginning to experienced bird feeding enthusiast. 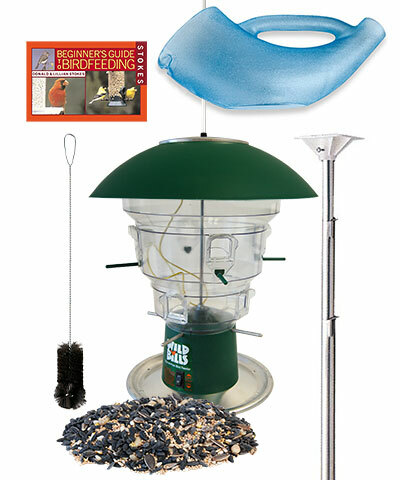 The Wild Bills Electronic Squirrel Proof Bird Feeding Package is ideal for anyone just getting started or anyone interested in adding a new dimension to an existing bird feeding sanctuary. Qty 1 Droll Yankees Bird Feeder Brush, 24"